Basically this system acts as a distributed PLL. 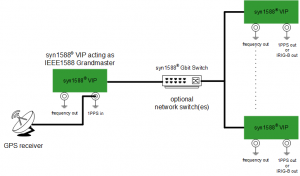 A syn1588® VIP may act as an IEEE1588 Grandmaster on your network. 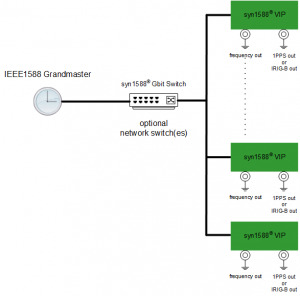 The syn1588® VIP may synchronize its local hardware clock to an external absolute time reference like e.g. a GPS receiver. The syn1588® VIP acts basically like a GPS receiver without the need for an antenna. It supplies a 1 PPS pulse and a NMEA compatible data stream on the serial interface (of course without positional data). In master mode syn1588® VIP can accept GPS data as input.